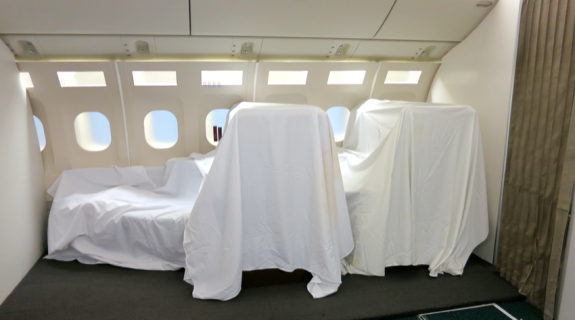 Nothing is more fun than going behind the curtain at an airline, airport or hotel, to see how things really work. Luckily, travel writers get to do just that every now and then. Recently Cathay Pacific invited me to tour the airline’s operations in Hong Kong along with a group of journalists from all over the world. 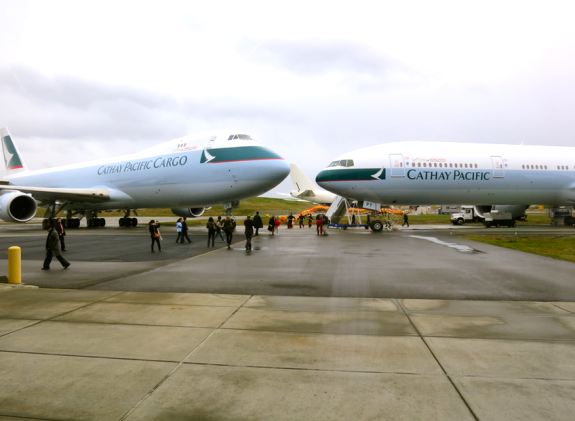 That day, we saw Cathay’s flight operations, catering and cargo facilities and had an opportunity to talk with key executives, all at the airline’s headquarters. Gazing from the windows of our group’s bus, I could see why the HQ megaplex is dubbed “Cathay City.” The large complex of many modern glass-and-steel office buildings is indeed a city unto itself. Cathay-logoed busses circulate everywhere and empty employees at office buildings’ front doors. In the center of it all in a small, grassy park, there’s a life-sized replica of Cathay’s second aircraft, affectionately called Niki, positioned as if in perpetual take-off. I learned a lot and saw some unusual sights. (Think: a giant “wok” of stir-fried rice big enough to serve 300, or a five-foot-long toy car wrapped in plastic for shipping.) And I experienced many “so that’s why” moments. 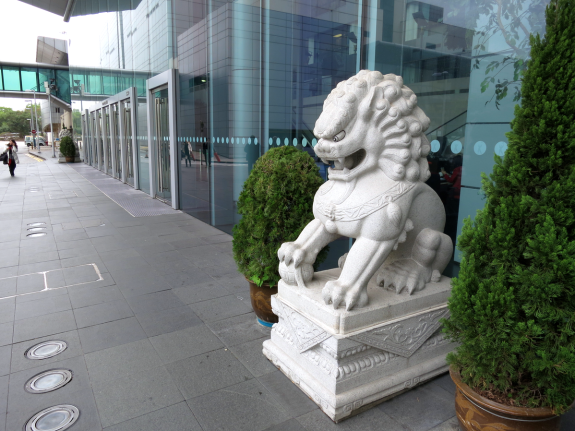 Here are 10 cool things I learned during my visit to Cathay City in Hong Kong. 1. A bit of history surprised me, given Cathay Pacific’s dominance in Asia and home base in Hong Kong. An American and an Australian, both ex-air force pilots, founded the airline following World War II. Even now, fewer than 20 percent of CX pilots are Hong Kong Chinese and the executives I met were mostly Brits. Cathay Pacific is the world’s 19th largest airline by operating revenue. 2. Shhh! 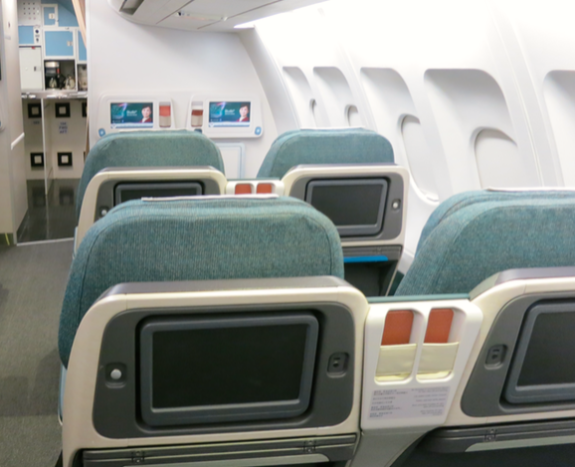 We toured Cathay’s super-secret cabin lab, a mockup of an aircraft interior where new designs of everything from wall panels, seats, and carpet are tested. But most of what was in the lab had been covered with white bed sheets so our inquiring eyes couldn’t spot—and broadcast–the next big thing. When a new seat product is under development, everyone from frequent fliers to the Chairman tests it with overnight stays. (Seeing our looks of envy, our guide told us, “It’s not as much fun as you might think.”) My SFO-HKG-SFO flights were on Boeing 747s, outfitted with a walled business class seat in a 1-2-1 configuration. I call it the “introvert seat” because each seat’s high walls shield you from even making eye contact with another human. Others (extroverts, I suppose) describe it as “coffin-like.” In any case, I found the privacy to work even better than Ambien and slept like a baby. Cathay is in the process of replacing the 747 with the 777 to San Francisco, so passengers enjoy new seats with a little less privacy but more features. 4. All food created in an airline catering operation must be cooked, then cooled, then reheated onboard. Tricky. Some items, like beef, are initially cooked to medium rare, to allow for onboard heating. On my return flight I enjoyed an omelet that I may very well have watched being made (by hand) the day prior during our kitchen tour. At the time, I wondered why the eggs looked runny. Onboard, having been reheated, the omelet was the perfect consistency. 6. Every item offloaded from a plane that will be reused on a future flight must be sanitized. That means meal carts, headphones, soap bottles, on and on. These go through their cleaning in the inbound area of catering operations. For example, every emptied meal cart is run through the cart washer, cleaned with thermal sanitation, dried here and then returned for reuse. Makes sense: Your meal is only as sanitary as the cart from which it is served. 5. Rapidly changing consumer technology can hamstring airlines, as they try and keep up. We sat in a cabin mockup of short-haul business class seats already in service. A niche is molded into the seatback to hold a phone. Nice touch. Trouble is, the niche was designed for iPhone-size smartphones. Now, many phones are larger and will not fit in the indentation. (You’re just going to have to rest your Samsung Galaxy S5 on your tray table.) Also, the seatback monitors were built with a dock for the iPhone. Then, Apple changed the pin-size of its dock connector. A good idea instantly became obsolete. 7. Cargo flies two ways: in the belly of passenger planes and in freighters (usually 747s). Since 2011, cargo demand has been weak, while supply of space has increased as airlines have expanded, especially internationally. That’s bad news for the cargo business. But I learned it’s just one more reason airlines love the 777 (besides its fuel efficiency): the 777 belly holds 20 tons of cargo, while the 747 (passenger version) holds only half that (10-12 tons). More and more of the cargo business has moved to bellies, to reduce costs. An indication of the lackluster cargo climate: Cathay Pacific currently has four freighters parked in the Arizona desert. 8. Ever found a hair in your airline meal? I didn’t think so. The standards of hygiene in airline catering are, by necessity, excessive. 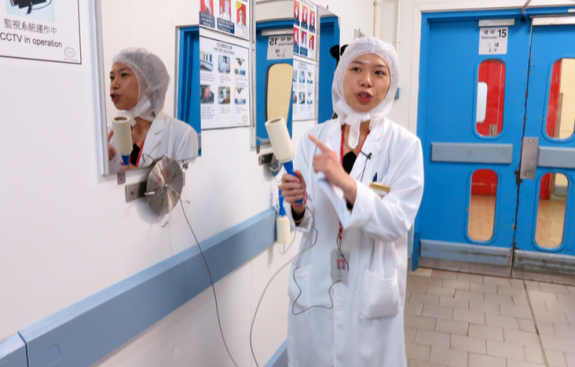 As visitors, not only were we required to wear a white coat, shower cap, and additional cap, but prior to entering the kitchen we used a roller to remove any stray hairs from the white coat and went through two rounds of hand washing and sanitizing. And we did not even get close to any food. 9. 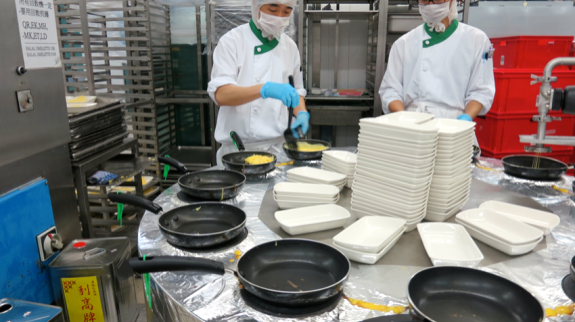 Cathay operates complete kitchens for kosher and halal meals, and each is separate from the general catering kitchen. Kosher meals are made according to Jewish guidelines based on the Old Testament. Halal meals are made according to Muslim guidelines based on the Koran. It was explained to us that regulations for halal meals are even more detailed than for kosher. The staffers who work in these kitchens must be trained by societies specializing in kosher and halal food preparation respectively. I did not order either of these meal types and would see no need to unless your religious beliefs required it, but I have no doubt they are excellent, as I saw the care with which they were made. 10. Ever wonder how some airlines master superior soft service from flight attendants while others don’t? Well, I met one of Cathay Pacific’s secret weapons: Crystal. She is an inflight service manager, an über flight attendant who oversees the entire cabin crew on a flight. With us, she simulated a meeting she would lead with her crew before boarding. In the meeting, she consciously raises or lowers the energy level of the group. She also quizzes the crew on how certain safety situations are to be handled. But all with kindness and a smile. Listening to her felt a little like eavesdropping on a happy-flight-attendant cult. She must have used the airline’s tagline, “service straight from the heart,” a dozen times and clearly works hard to evoke this from her flight attendants. Sounds a little fakey, I know, but it sounded sincere enough that it hooked me. 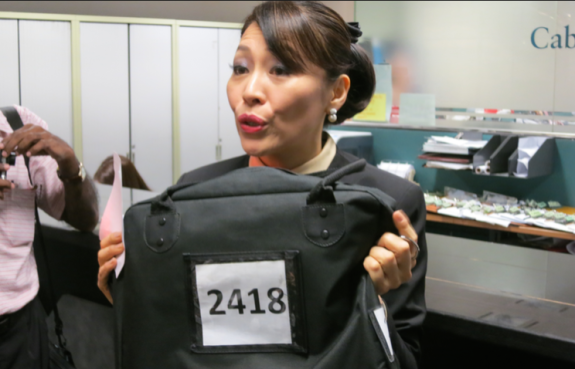 Crystal said if she died and came back for another life, she hoped she could work at Cathay Pacific again. You cringe. But the thing is, I believed her. By the way, lest you blame labor unions for U.S. legacy carriers’ inability to provide “service straight from the heart,” the CX flight crew union is said to be one of the most aggressive in Hong Kong.